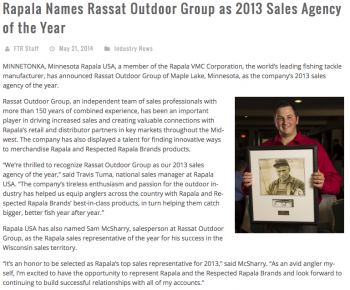 At Rassat Outdoor Group, we understand your passion for the outdoors. With our team of outdoors sales professionals, it is not just a business, it is our lifestyle. With over 200 years of combined experience, we are committed to the outdoor industry and pledge superior service to our clients. We are committed to building long lasting relationships between our clients and vendors. We understand the outdoors business from all aspects. Let our vast marketing experience in fishing, ice fishing, hunting and the great outdoors help you get your products to its target audience. With proper and timely sporting goods merchandising we can also help your company increase product turns and increase your customers Gross Margin Return On Investment (GMROI).